I began reading a book by Alastair Campbell, and I won’t review the book here because I merely began reading it a few days ago. 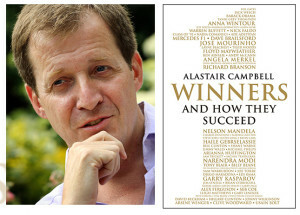 At any rate, Campbell lays out something that all winners in the world have. They have an OST. Winners have an objective or popularly known as a goal. With that objective, winners have a strategy to obtain the goal. Most people have goals or objectives, but they do not have sound strategies or a strategy period to get what they want. Campbell says this is nearly the most vital thing today because knowledge is everywhere. People have access to the same coaches, teachers, mentors, leaders, and everything else that the next man and woman has access to. What set’s winners from losers is strategy. What’s important about strategy is that it must be written down. The last thing is tactics. Just because we have a strategy doesn’t mean everything is going to go as planned. This is where tactics come into play. Tactics are thing things you must do to establish the strategy. I guess, said another way would be the “GPA,” goal, plan, actions. As I get more into the book, maybe I’ll do a review or maybe just give more micro tips for you. Develop your OST today! The new year is coming upon us, it is a good time to write out a new OST or refine the one you’re currently working on! Fake Positive People, Positive All the Time!